A large, unexpected expense such as a broken HVAC system is never a pleasant surprise. However, you don’t have to suffer through an uncomfortable season. 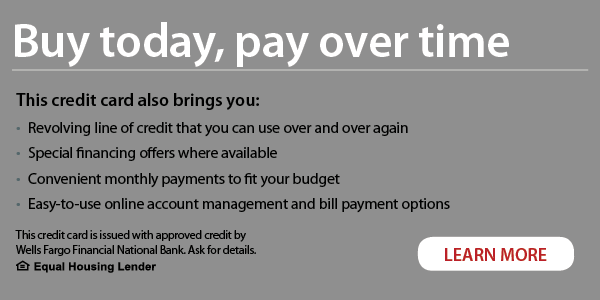 You can take advantage of one of our several smart financing options. Russell & Abbott offers special financing on the purchase of your new home comfort system. There’s an option available for most qualified customers. Qualified applicants can receive special financing terms for 60 months. Financing your new system is a seamless process. We offer promotional financing options with no pre-payment penalty. Our full service financing team has the expertise to guide you through the process and select the best option for your need. There is no down payment necessary and no penalty for paying off your purchase early. 0% APR for 60 months with equal payments. * This promotion is offered on our “Platinum” systems. 0% APR for 48 months with equal payments. * This promotion is offered on our “Gold” systems. 0% APR for 36 months with equal payments. * This promotion is offered on our “Silver” systems. *The Wells Fargo Home Projects credit card is issued by Wells Fargo Financial National Bank, an Equal Housing Lender. Special terms apply to qualifying purchases charged with approved credit. The special terms APR will continue to apply until all qualifying purchases are paid in full. The monthly payment for this purchase will be the amount that will pay for the purchase in full in equal payments during the promotional (special terms) period. The APR for Purchases will apply to certain fees such as a late payment fee or if you use the card for other transactions. For new accounts, the APR for Purchases is 28.99%. If you are charged interest in any billing cycle, the minimum interest charge will be $1.00. This information is accurate as of 02/21/2018 and is subject to change. For current information, call us at 1-800-431-5921. Offer expires 12/31/2018. We accept Mastercard, Visa, Discover, American Express, and Paypal. Additional financing options are available from time to time as different promotions become available with different vendors. Please ask if a special promotion is available to fit your needs. Call Russell & Abbott at (865) 982-5133 to ask for details about equipment on Platinum, Gold, and Silver systems. Conserve Working Capital. When a business leases new air conditioning equipment, working capital is not reduced and bank credit lines are not affected. Working capital can be used elsewhere or kept in reserve for other needs.